The whole family will love this kid-friendly gluten-free crisp recipe. 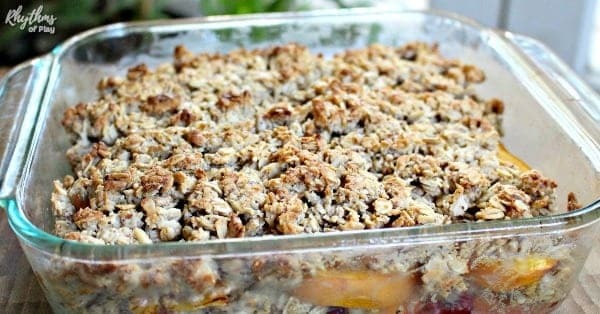 Serve peach raspberry cobbler warm right out of the oven as is, with fresh cream, or vanilla ice cream! My family fell in love at first bite with the tangy sweet flavor of this gluten-free cobbler recipe, and I think you will too. During the summer months, we always have an abundance of fresh peaches and raspberries in our garden. I decided to use some up by making a peach raspberry crisp. The next day my family clamored for me to make it again. 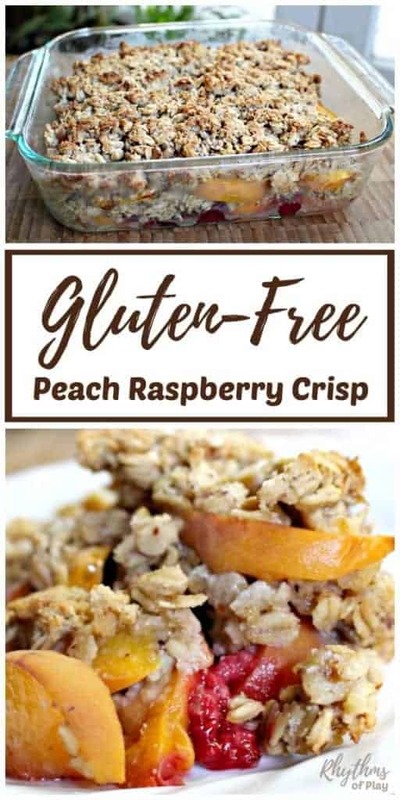 I adapted this super yummy gluten-free peach raspberry crisp recipe from an Apple Crisp recipe found in the Moosewood Cookbook by Mollie Katzen. One of my most used cookbooks of all time. I used fresh peaches and raspberries instead of apples, almond meal instead of flour, maple syrup instead of honey, and I left out many of the spices that taste better with apples. I’ll bet your family will love the tangy sweet flavor of this healthy kid-friendly dessert! Slice (and peel) the peaches. My family thinks that this gluten-free cobbler recipe tastes delicious with the peels on or off. It’s a lot quicker and easier to make if you leave them on. Combine with oats, almond meal, nuts, seeds, and salt. Set aside. Grease a 9 × 9 square pan . Place a layer of peaches on the bottom of the pan. Toss raspberries in to fill the gaps. Both the peaches and raspberries came straight from our garden–Mmmm! Crumble half of the oat and almond meal mixture on top of the peaches and raspberries. Use a food processor if you would like your almond meal freshly ground. Place another layer of peaches and raspberries on top of the oat mixture. Crumble remaining oat mixture on top. Bake 25-30 minutes uncovered @ 375° (cover if it crisps to quickly). The sides should be bubbling and the top golden brown when finished. I like to bake gluten-free crisp in our convection oven to make a slightly crunchy yet deliciously chewy top to go along with our vanilla ice cream–Yum!! Gluten-Free Crisp Recipe the Whole Family Will LOVE! 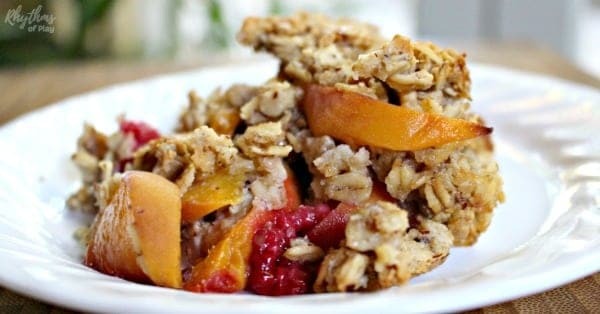 The whole family will love this gluten-free peach raspberry crisp recipe. Serve warm right out of the oven as is, with fresh cream, whipped cream, or vanilla ice cream–yum! This gluten-free cobbler recipe is a great farm to table recipe to make with the kids. You can make it with peaches and raspberries in the summer and apples throughout the fall and winter. This sounds amazing and I just happen to have both peaches and raspberries! I do have fresh peaches but I also have home canned peaches. Could I use either in this recipe? Yes, You could use canned peaches. Make sure you rinse and drain them. They will not be as good as fresh, but it will still be good!